Flip a switch and CircleSuite will automatically schedule and post Real Estate content to your social media accounts for you. You can also schedule your own posts to publish at multiple times throughout the day, week or month. Choose when and where you want to share content. Autopilot has your back. Don't lift a finger and get automatic posts to all your social networks. 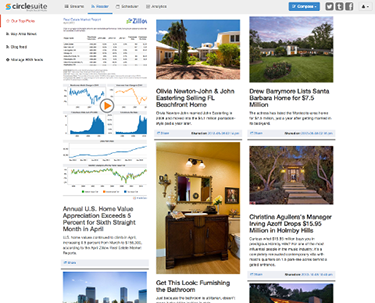 Share your favorite content from trusted sources in two clicks. Schedule several posts to publish at multiple times throughout the day, week or month. If you want to lift a finger... In less than a couple of minutes, schedule a post to all your social media sites. Announce your Open Houses, New Listings, Coming Soon, Just Sold, or whatever else you feel like. Review all of your content from your personal reader. 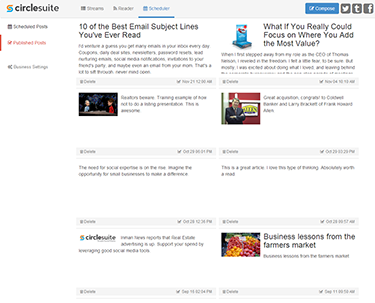 CircleSuite Top Picks - Every week we add quality content to the reader for you to use. RSS Feeds - Sync up with your favorite RSS feeds to supplement the Circlesuite Top Picks. 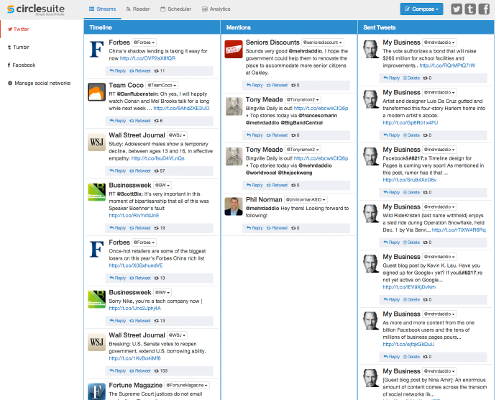 Manage all your social networks and interactions from one place. Interact with customers and followers.